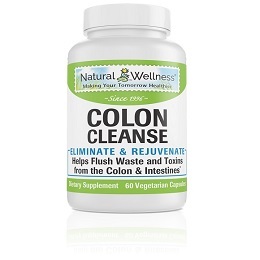 I have had intestinal problems for 30 years or more, since I have been taking your probiotics they have all gone away...I used to swing from constipation to diarrhea often and have problems with gassiness...no more! Let's be honest, digestive problems aren't fun. Stomachaches, gas, bloating, constipation, and diarrhea are uncomfortable and potentially embarrassing. Many of these types of digestive issues can be a result of an imbalance of good bacteria in your digestive tract. Now if you have a liver that is not working at its best, it also negatively affects your digestion since you cannot break down all you eat, meaning you are not getting the nutrients you need for good health. It's a double whammy that likely makes you feel tired and just plain crummy. Therefore, protecting your digestive tract should be extra important to you. Super Probiotics has 10 billion living cells per dose. This makes it a very powerful, high-potency formula. 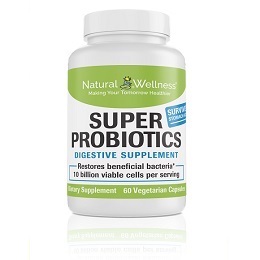 Super Probiotics helps to quickly restore healthy levels of beneficial bacteria in the stomach and intestines. It can effectively alleviate and prevent serious gastrointestinal and immune conditions and/or help support long-term intestinal health, in both the small and large intestines, and prevent fat accumulation in the liver. 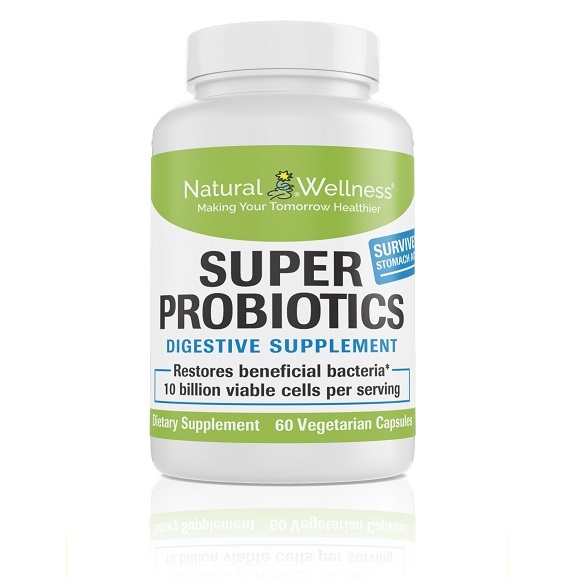 The 8 probiotic strains in this formula support gastrointestinal and immune health, and they have the ability to adjust to extreme changes in environment (i.e. pH, temperature). This ensures that these probiotics can remain active in places like your stomach, which is very acidic, so that they can successfully travel to your intestines where they are most needed. It also means that no bacteria is lost during manufacturing and that they can withstand temperatures during delivery and in your home. Once established, a normal, healthy intestinal microflora helps to create an environment that is unsuitable for the growth of pathogenic bacteria. This supplement is made using Bio-enhanced Acid Resistant Strains (BEARS), making it able to withstand the acidic conditions in the stomach during digestion and remain active in both low and high pH environments, without the need for a protective coating. Super Probiotics is manufactured with a patented poly matrix preservation system, so there is no need for refrigeration. 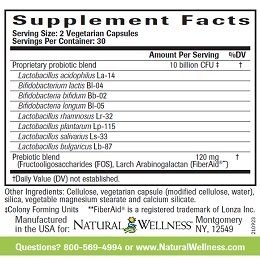 The prebiotic blend consists of FOS (food source for probiotics) and FiberAid®, a natural, patented prebiotic from Lonza® that helps support the growth of probiotics. There are billions of cells of helpful bacteria present in the gastrointestinal tract, and maintaining these bacteria are needed in order to digest and absorb food, keeping a healthy intestinal acid content – and to protect against pathogenic bacteria, which causes disease. Sometimes, such as after the use of antibiotics or an infection, your body requires help to correct the imbalance of good and bad bacteria, and this is where probiotics come into play. Probiotics are beneficial bacteria that help keep the digestive system running smoothly and can provide an environment for the continued health of the intestinal tract. The intestinal tract acts as a delivery system for the absorption of nutrients and the removal of waste material. It also plays an important role in maintaining a healthy immune system and fighting off pathogens. You immune system is a big part of this, as 70% of it is located in your digestive tract. Probiotics can help improve intestinal function, keeping the lining of the intestines strong, and helping to fight infection and inflammation. When probiotics and prebiotics are used in conjunction there is more of a chance for the survival of beneficial bacteria, as prebiotics are essentially food for probiotics. Antibiotics are used to kill bad bacteria brought on by illness but, in the process, they drain your body of some of the good bacteria. Traveling, stress, and diet can also cause your body to become imbalanced. When this happens you will experience digestive issues such as bloating, gas and diarrhea. By taking a probiotic your body can restore some of the good, beneficial bacteria that may have been lost. Probiotics are bacteria found in the digestive tract. They are essential for good health as they balance the digestive environment, inhibit the growth of harmful bacteria, promote digestive health and boost immune function. 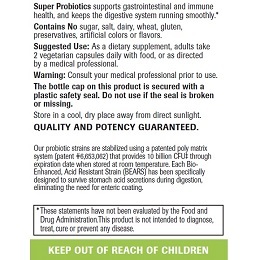 When buying probiotics, look for a probiotic blend that delivers 10-35 billion live organisms to the intestinal tract. Though it may sound like a lot, keep in mind that your digestive system needs trillions of good bacteria to stay on an even keel, so don’t be put off by the number of zeros involved! 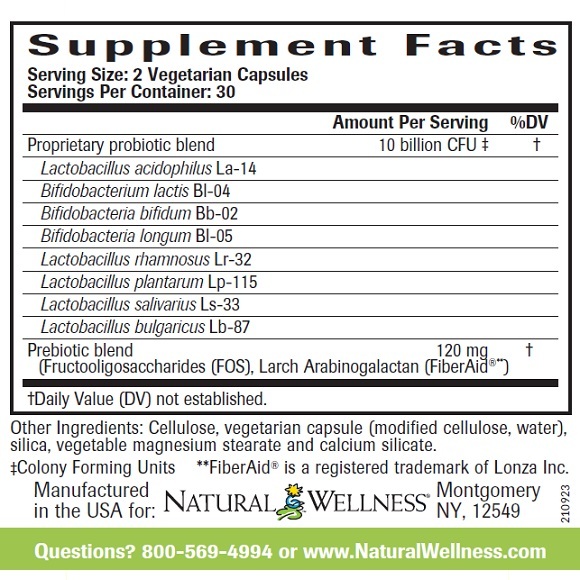 Looking for a stronger, 35 billion probiotic blend? 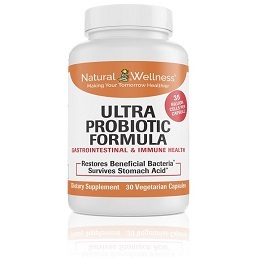 Try Ultra Probiotic Formula. Digestive Enzymes taken orally or produced by the body break down food into digestible nutrients so the food can be absorbed and utilized by the body. Everything we eat: - dairy, meats, vegetables, liquids, and so on - has to be broken down into their nutrient pieces so their nutrients can be absorbed. Nutrients such as amino acids (from proteins), fatty acids and cholesterol (from fats), and simple sugars (from carbohydrates), as well as vitamins, minerals, and a variety of other plant and animal compounds all must go through this process. If we don't have enough digestive enzymes in the body, we cannot adequately break down our food—which means even though we're eating well, we are not absorbing all that we can from our food. To maximize the health of your digestive system, you may wish to combine Super Probiotics with a digestive enzyme blend. 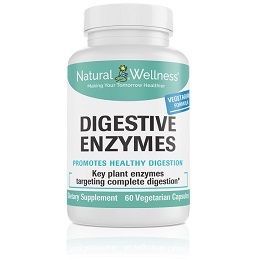 To learn more about Digestive Enzymes, click here. Kept me regular, happy digestive system. This is a great probiotic. Gentle on stomach but very effective. Have my whole family on this stuff! 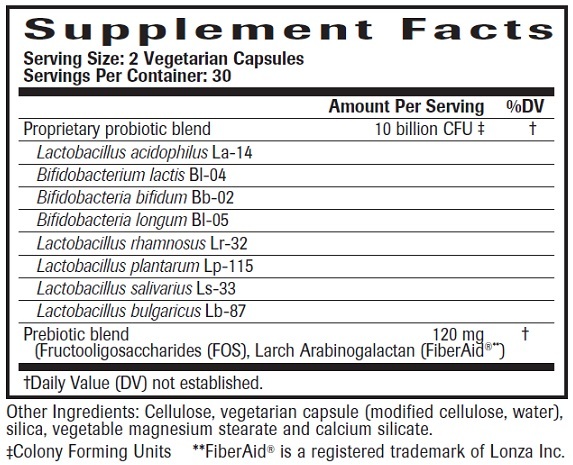 As a dietary supplement, adults take 2 vegetarian capsules daily with food, or as directed by a medical professional. 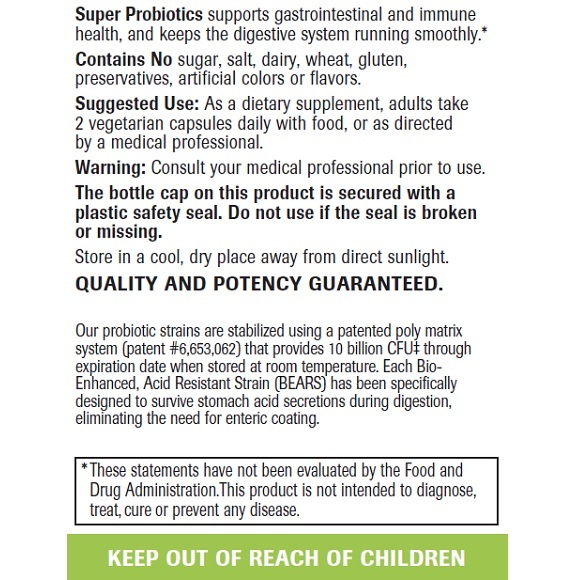 Super Probiotics is MANUFACTURED in the USA to meet FDA strict current Good Manufacturing Practice regulations (cGMP).